Last Sunday was the Fourth Sunday of Lent, so therefore we are more than halfway through this season of the Church year. Perhaps we are at the point of looking for something worthwhile to do for the next two weeks as we prepare for the great celebration of the feast of Easter. We could look at how we participate as a member of our human family. Lent is often a time given over to “holy” words of repentance and promises of self-reform but: “However many words you speak, what good will they do if you do not act on them?” (Buddha). Whatever our culture, religion or language, we want food, shelter and good health. We want to be able to get up in the morning, enthusiastically, and sleep safely at night. We want health, safety and happiness for our loved ones. We want to know that our lives are purposeful and sometimes gracious. We want to feel part of something greater than ourselves. St Paul in his inspiring letter to the people of Philippi encouraged them to, “show an agreeable attitude to everyone”. Our spirituality is as personal as our breath or our fingerprint, but, as we move through the forty days of Lent, we might on occasion, surrender freely to the quiet within us, to rediscover the resources and strengths that are there. We might begin to see better and appreciate more, the value of our existence, to see ourselves with more gratitude and respect and to see others in a like manner. Lent challenges us in many ways. It is an opportunity to challenge ourselves to see the good in situations rather than focus on the negatives. When we work with children to help them with issues, we give them strategies to use which assists them in staying positive at school. It is easy for us as adults to identify when children are creating a big issue out of something small, but do we realise when we are doing it ourselves? Researchers have also found that there is more and more evidence that optimism and positive thinking has real health benefits, including a reduction in stress which assists in developing stronger immunity. With only one week of this term to go, I would like to take this opportunity to congratulate all members of the Infant Jesus School community for their endeavours and efforts. Where has the term gone? The last ten weeks have just flown by and the students, in particular, have been most active coping with the rigors of life in a primary school. The atmosphere around the school this term has been very positive. 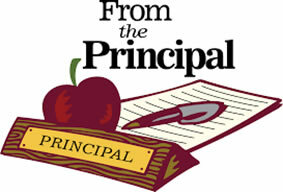 It has been tremendous to see staff, students and parents working collaboratively in many of the school activities. Most parents by now would have had the opportunity to meet with their child’s class teacher and discuss their progress. I acknowledge the efforts of the class teachers for making themselves available for this very important communication and reporting strategy. Thank you also, to all members of the community who have contributed in some way to the education of the students and the development of this school. We have new members on our School Board as well as our P&F Executive and Class Representatives. All of these groups play an important role in the development of our school. Hopefully our School Hall will be up and running for the start of Term Two which will wonderful news for all. Thank you so much for your patience and understanding over the course of the term. As I have said previously, it has been the first time in over 20+ years a principal I have not been able to gather with the students and community. Lastly, thank you to all members of the Infant Jesus School community who have contributed in some way to the education of the students and the development of this school over the term. I hope each of you have a wonderful holiday and a very holy Easter. I look forward to seeing everyone return to school on Tuesday 30 April, refreshed and ready for the start of a new term. You have been able to enjoy the wonderful experience of meeting Jesus …But the experience of this encounter must not remain locked up in your life or in a small group of your friends, your movement, or your community. Once again, there is great excitement within our school as we prepare for our School Colour Run next Friday. The children are very enthusiastic to participate in this event as they are blasted with colour. They certainly will end up being very, very colourful!! We are very grateful to our P&F Executive and the many helpers who have volunteered to assist at this event. This fundraiser was very successful last year, and we have no reason to doubt that the 2019 Colour Run will be any different. 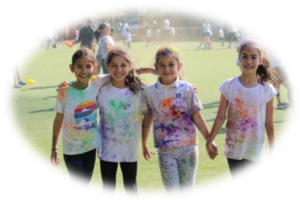 As already advertised, the money raised from the Colour Run by the children will go towards reading resources, upgrading classrooms with some new furniture and technology equipment. During this season of Lent we have tried to reflect on how we could follow the example of Jesus more closely and make a positive difference. It is a time to think of others, to pray for them and to consider something extra that we may be able to do to help. Lent is also a time for quietness and prayer as we continue to prepare for Easter. In preparing for Easter we celebrate the events of Holy Week which includes Palm Sunday, Holy Thursday and Good Friday. 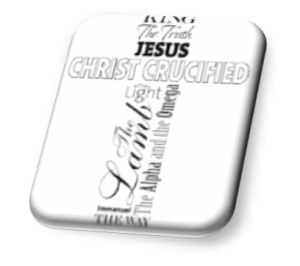 As part of this preparation, next Thursday 11 April, the students in Year 1 – 6 will gather at the Infant Jesus Church at 2.00pm to pray and to reflect on the events of Good Friday through the Stations of the Cross. Students will be involved in dramatizing the Stations of the Cross, but it is not a performance. 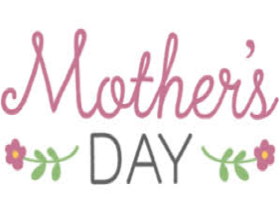 Parents are welcome to be present for the Stations, but are asked to remember that this will be a very prayerful and solemn occasion as we remember the Passion of Christ. For our school community to offer an environment of harmony, goodwill, opportunity for individual development and the exercise of Christian virtues, it is important that we constantly remind ourselves to think about what we are saying and how we go about saying it, particularly in the presence of children. During the past week, parents have had the chance to catch up with their child’s class teachers and discuss individual student progress in the year so far. This is viewed as an important opportunity which well supports the education partnership that we believe to be a vital component to student success. Once again, where parents and carers were unable to avail themselves over the time scheduled, I would encourage you to organise a more mutually convenient time with your child/ren’s class teacher/s. Many thanks to our Teaching Staff for making themselves available for these interviews over the course of the week and for accommodating different family needs. A reminder to all parents that next term all students are required to be in winter uniform. To assist parents and students in this transition, a two-week change-over period will be permitted. However, all students are required to be in full winter uniform by the commencement of Week Three. Please refer to the uniform policy on the school website for further information. As parents are aware, this year we introduced a program called i-Perform. This program will provide students in Years 1 – Year 3 the opportunity to develop their skills and abilities in the Performing Arts domain. 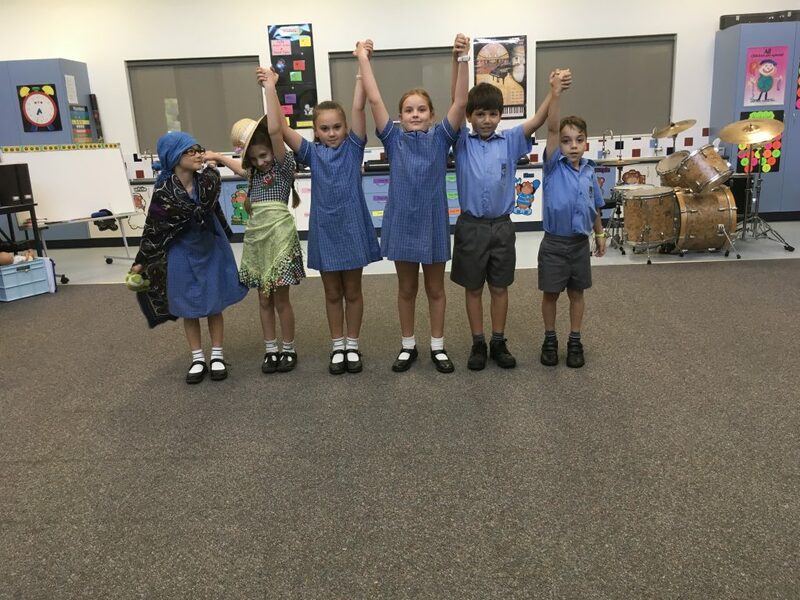 The i-Perform program has been developed by Miss Claire Condipodero to give the lower primary students’ the opportunity to extend their creativity and performance skills in the areas of drama and speech, improvisation, role-play, scripted performance, poetry and dance/movement – to name a few! 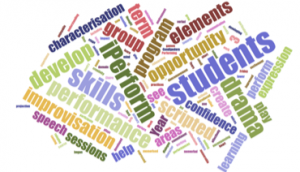 We see it as an opportunity for students to create, rehearse and actively perform and learn about the elements of drama, characterisation, improvisation and performance practices. This aims to develop their confidence and speech skills and help them to work effectively in a group environment. As these skills nurture the creative mind, it has a positive impact towards all learning areas. i-Perform began this term with Year 3 Blue. The students participate in weekly sessions in a small group setting. Each group of 3B students have been rehearsing a short, scripted play, which they will perform on Friday of Week 10 this term. The enthusiasm and commitment of our students to their scripted plays has been outstanding. 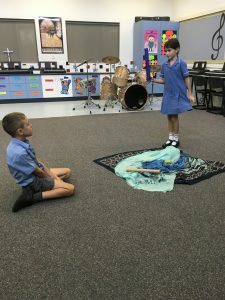 They have been working very hard on developing expression in their voices to create meaning to their character’s dialogue and encompassing the elements of drama into their performances. We have been particularly impressed that most of the students have now memorised all their lines off by heart! During the i-Perform sessions we play simple drama games, which help develop the students understanding of the elements of drama, including characterisation, improvisation, verbal and non-verbal communication skills, how to use the voice on stage with expression and projection, and how to develop plot and character thought. It has been a joy to see the students’ performance skills and confidence grow over the course of the term, and the excitement they have expressed when coming to i-Perform – making this learning experience both enjoyable and memorable for them. Our school canteen will be back in operation next term. The Term Two menu will be posted on the website over the school holidays. Every year, all Year 3, 5, 7 and 9 students across Australia participate in NAPLAN. These assessments provide class teachers, the school, the system, the State and the country with valuable information about student ability and needs and are used in conjunction with other assessment data to inform decisions across all levels. This year NAPLAN will take place from Tuesday 14 May to Friday 24 May. 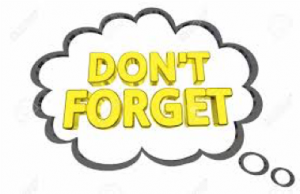 If you have any queries or concerns in regards to NAPLAN, please visit the official website at http://www.nap.edu.au/naplan/ parent-carer-support/parent-carer-support.html, contact the classroom teacher or Clare Moffat (Support Coordinator) at the school. We have been asked to stress that NAPLAN is not something that needs to be or can be ‘studied’ for. Rather it is an assessment based on content and skills from the Australian Curriculum. Teachers will ensure that students are comfortable with the style of assessment and are always ensuring that we are following the Australian Curriculum. NAPLAN is not a pass or fail type test and is designated to illustrate the range of student performance across the country. It is not expected that students will be able to answer all questions correctly. Parents of Infant Jesus School students will also be aware that our children complete NAPLAN online. 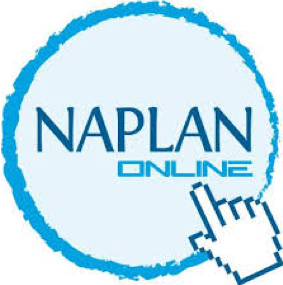 We were asked to trail this last year and it was very successful from an administrative point of view, so this style of NAPLAN (online) will continue in 2019. Eventually all schools will be completing NAPLAN online. Parents will be provided with a NAPLAN report for their child in mid-September. Individual student performance is shown on a national achievement scale for each test. The performance of individual students can be compared to the average performance of all students in Australia. 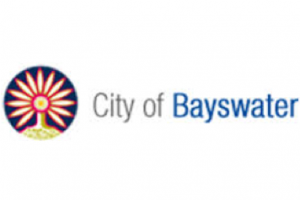 I received the following correspondence below from the City of Bayswater this week. on a with the “bus zone” sign applying to a bus zone. Whilst we appreciate the limited parking opportunities within the area, neither the school nor Rangers and Security have authorisation to allow the bus zone area to be utilised as a drop off and pick up point. It was noted that the short-timed parking available on Russell Street, Morley were not being utilised. Rangers and Security Officers will continue to sporadically monitor the area surrounding your school to assist with ensuring a safe environment for children, parents and the community. In addition, we have recently organised for updating of signage within the area. This will ensure compliance with the nationally recognised school time zones and provide clarity as to parking locations. Parenting Ideas always keeps a close eye on parenting trends so we can help keep you ahead of the curve. With this in mind Parenting Ideas founder Michael Grose will guide you through eight new parenting trends for 2019. Amazingly, when Australia conducted the first Child and Adolescent Survey of Mental Health and Wellbeing in 1998 anxiety wasn’t listed in the list of disorders that impacted kids. It wasn’t on the radar in the same way that major depressive disorders and ADHD were. With one in seven Australian kids in the 4-18 age group experiencing a mental health disorder, it’s fair to say anxiety is on the radar now. The last few years have seen the rise in the normalisation of anxiousness across all strands of the community. People from all walks of life are talking about it and there’s more knowledge about its management. There’s so much to learn and Parenting Ideas have a lot to share about this parenting trend, beginning with my Managing your child’s anxiety webinar in May. The Positive Psychology movement has been a strong influencer on school wellbeing practices for many years, but it’s struggled to have cut-through with parents – until now. The huge success of Professor Lea Waters’ book ‘The Strength Switch’ has seen parents start to embrace the strength-based approach with their families. 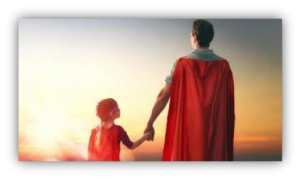 The holistic nature of this approach appeals to parents who are able to use knowledge of their children’s strengths to motivate, boost confidence and better manage their behaviour. We’re thrilled to have presented Prof. Lea Waters in her webinar on this topic recently – Switching on your child’s strengths. 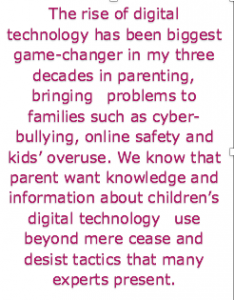 The rise of digital technology has been biggest game-changer in my three decades in parenting, bringing problems to families such as cyber-bullying, online safety and kids’ overuse. We know that parents want knowledge and information about children’s digital technology use beyond mere cease and desist tactics that many experts present. 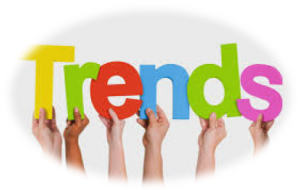 Successful integration of children’s technology use into family-life is trending as a topic. Parents want kids to experience the benefits of digital technology, while staying safe. They also want to know how digital technology approach can enrich family-life rather than detract from it. The wellness industry has been thriving for years now and it’s beginning to make its mark on families. 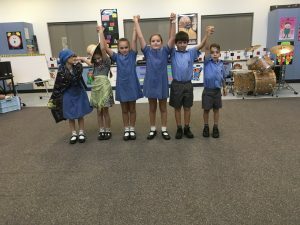 ‘Find a balance’, ‘Don’t over do your studies’, ‘Make sure you choose at least one subject you enjoy.’ The language kids hear is beginning to reflect the move toward mental health practices as a normal part of life, for happiness and wellbeing, and not just for optimal school success. Parents will continue this year to look for the latest research, information and strategies to support the mental health and wellbeing of their families. Schools, as a trusted source of information, have a significant role to play in educating parents about this trend. Has the student extra-curricular activity trend reached its nadir? Has kids’ busyness peaked? For many years the benefits of kids being involved in extra-curricular activities has been spruiked, while ignoring the cost in terms of overworked kids, frantic parents and stretched family time. Now get ready to hear the word ‘balance’ replace the terms ‘benefits’ when extra-curricular activities are considered. The potential stresses that student overload can cause on family-life and parent wellbeing is now a common concern. In this increasingly competitive educational climate parents are yearning for more balance. This year Parenting Ideas well-being expert Dr. Jodi Richardson is conducting a practical webinar to help parents strike the right balance between kids’ activity, their mental health and family-life. As a community we’ve struggled for many years to create rites of passage for young people. Once a young person’s first job, or their twenty-first birthday were significant markers of maturity, offering a sense that they were entering into the adult world. Community changes have largely eradicated these traditional markers, which makes it harder for a young person to know when they’ve become an adult. There are many healthy ways to recognise a young person’s growing maturity and mark their journey into adulthood. Many families are now creating their own to mark events such as the end of primary school, the move into the teenage years, and different stages of adolescence. This year Dr. Arne Rubenstein will show parents how to create 21st Century rites of passage in a webinar he’s conducting at Parenting Ideas. We hope this trend is here to stay. Sleep has been high on most school’s ‘must reinforce with parents’ lists for the last few years. And rightfully so, as Australian kids haven’t been getting enough of this performance-enhancing, mental health-boosting activity. Most sleep messages provided to parents have focused on the development of good sleep habits, with regularity and routine being the major strategies. These are slim pickings indeed in the light of recent sleep findings from the world of neuroscience. The 24-hour body clock (circadian rhythm) until now has been thought to regulate feelings of sleepiness and wakefulness over a 24-hour period. Recent findings show that the body clock drives the timing for so much of our bodily and brain functions as well. Working with the body clock means not only does a child or teen get a good night’s sleep, but it also helps them maintain optimum body and mental performance. Work against it and not only is their mental health affected but daily tasks are more difficult to perform. The most remarkable finding though, is that we can reset our body clocks every day. That’s exciting as it’s easier than we first thought for kids to get the proverbial good night’s sleep. It’s a matter of making the body clock work with them, rather than against them. A decade ago the British did something simple yet profound. Realising that parents needed to converse with their kids if they were to influence their behaviour and thinking they conducted a nation-wide campaign to encourage parents to regularly share meal times with their children. So successful was this campaign that it saw a significant increase in shared mealtimes and has been attributed to giving back to parents the ability to have influence, which was previously considered to be lost, over their children’s behaviour. In Australia, parent-child conversations have been promoted as a relationship-builders, rather than ways to impact on children’s and young people’s behaviour and thinking. As our world is becoming increasingly chaotic and fast changing, parents are once more seeing the benefits of two-way exchanges with children about a range of issues. The meal-table, something so central to traditional Australian parenting, and in later years somewhat neglected, is now making a comeback. And we’re thrilled about that. Awareness of trends influences our work at Parenting Ideas, and we believe it should influence the reading and learning of parents. It’s our observation that the most savvy and confident parents are those that keep one step ahead rather than always playing catch-up with what children and teenagers are thinking and doing. become more like Jesus during this time. Let us show our love by making peace and trying to make things better. Let us show our love by caring about the happiness of others and by thanking them for their goodness to us. Let us love one another as we share our meals and laugh and celebrate together. Help us, Lord, to love one another as Jesus has loved us. common people to attain uncommon results.